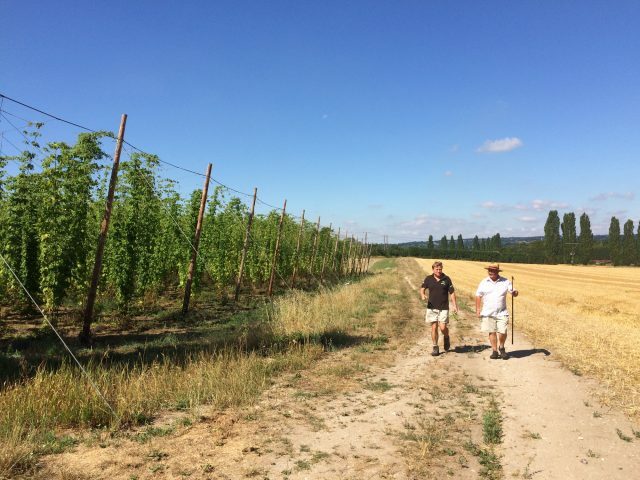 With a record UK grape harvest and a shortage of barley predicted, Hogs Back brewery in Surrey has said that this year’s hop harvest will be about “quality over quantity” as the lack of rain has “affected development”. Hogs Back is preparing for this year’s harvest which will take place in mid-September. The Farnham-based brewer will then be moving its hop garden to larger site, over double the acreage of its current location. Having planted the garden in 2014 in order to become more ‘hop sufficient’, the brewery sources just under a quarter of its hops from its own garden. It aims to increase this figure to around 50% following the move which is expected to be completed by early next year. The brewery has remained candid about how the experience has been a learning curve, last year discovering a mysterious ‘gender swap hop’ in the garden and subsequently finding other male plants. Generally, there is about one male hop plant to every 1,000 females. Estate manager Matthew King said, “This is the first extended period of dry and hot weather we’ve experienced since planting the hop garden in 2014. Hops thrive on heat and sunshine, but the lack of rainfall has affected their development. They are drawing water up to the top of the plant which is looking very healthy, but we’re not seeing as much lateral growth lower down. “For this reason, we’re expecting this year’s harvest to be more about quality than quantity. We’ve learned a lot this summer about how hops respond to hot and dry weather, which will stand us in good stead when we move to our new hop garden”. The new 8 acre site is more than double the size of the current 3.5 acre hop garden, and is located within farm complex where the brewery itself is based. Work is due to start on the former wheat field this month which will ultimately involve moving the 2,500 established hop plants from the old garden to the new one. Hogs Back also added that due the absence of overhead power cables, the new hop garden will allow for taller hop poles, meaning the plants themselves will be higher both in stature and yielding capacity. Hogs Back Brewery managing director Rupert Thompson said, “This is a huge investment in the future of Hogs Back Brewery and we’re proud to be continuing the journey that started with the planting of our hop garden in 2014. “The new hop garden embodies everything Hogs Back stands for as a ‘farmer brewer’ and will make us an even more sustainable, environmentally-conscious business: we can measure the distance from hop garden to brewery in ‘food feet’ rather than ‘food miles’! “Expanding to the new garden will make us more self-sufficient in hops, ultimately providing around half our hop requirement, compared to less than 25% currently. Just as importantly, growing our own hops has made us better brewers, as with each harvest we’ve learned more about how the flavour of the hops is affected by the weather, and how that then impacts the quality and taste of the beer. “Getting closer to this key ingredient has given us a level of control over our beers that few, if any, other British brewers can claim”. Founded in 1992, Hogs Back grows four hop varieties: Fuggle (used in the brewery’s flagship beer, Tea), English Cascade (used in Hogstar English Craft Lager), Farnham White Bine (a historic variety now used in Hogs Back’s Farnham White) and Pioneer (a hedgerow variety grown for the first time last year and included in Home Harvest Ale).